The original 1970 Doors of Dublin poster showed the beauty of Georgian doorways around Fitzwilliam Square in Dublin, Ireland. The history of the Doors of Dublin poster can be found at the Irish Landmarks website or also at The Past Whispers website. 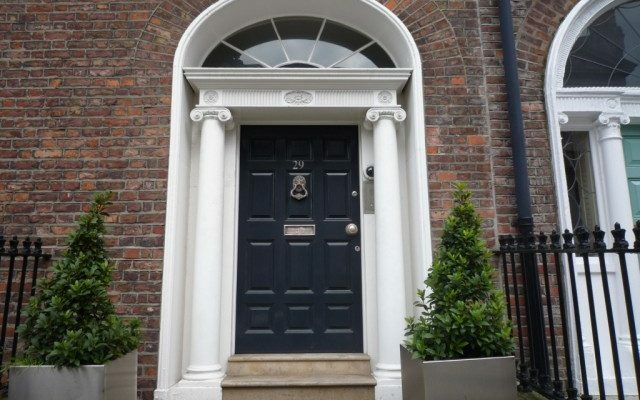 The story goes that a townhouse developer in Dublin laid down very strict architectural guidelines for these homes. Each home was identical to the next in the smallest detail. To differentiate them, home owners painted their doors different colours and added ornate door knockers or wrought iron boot scrapers by the front door. 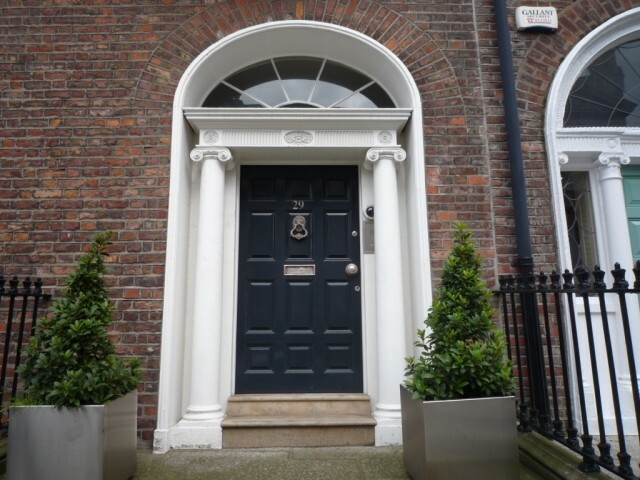 While on a trip to Ireland, I had an opportunity to view the doors of Dublin firsthand. Some of the doors which I saw were plain, such as the black door below. Other doors were more colourful, like the blue and red door below. Each of the doors has an arched transom above the door. Some doors had sidelites like the green door below. This red door has an arched transom, sidelites and columns all in one. How does the colourful gem below strike you? It’s the front door to Sarah Richardson Design. It incorporates bright red colour, sidelites and a transom. While it’s not in the style of the doors of Dublin, it certainly grabs your attention.